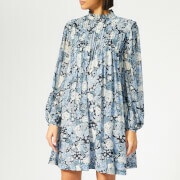 ‘Weston’ printed mini dress from Scandinavian label, Ganni. 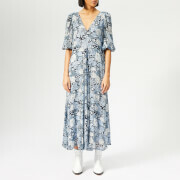 Presented in weightless cotton poplin, the white smock dress features a ruffled stand collar, cuffed balloon sleeves and pin tuck detail across the front and back. Fastening with a row of buttons to the reverse, the dress is completed with a Western-inspired horse print.